Can I write in Japanese, Korean, Chinese Simplified and Chinese Traditional, French, German, Russian, Spanish, Italian, Portuguese. Thanks. So if I understand you correctly and from what I briefly read...I can add the particular language that was pre-written in--Korean, add that using SVGs and the 'hand' will write the words out in Korean? For many languages, (English, Spanish, German....) it may be easiest to import a font that includes all of the alphabet in that language, and type the text directly into videoscribe. Thanks. Here's another question. Can the hand write from right to left? 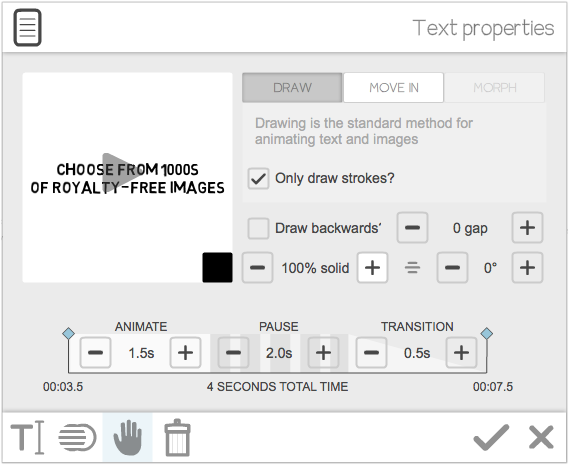 for SVGs videoscribe will draw them from right to left if you build them from right to left. It will probably work best with method two mentioned in my previous message. Thanks, but my version doesn't show me the 'Draw backwards' option?? Here is my Customer ref: A00005597, hopefully it helps u determine my version. I don't have access to anyone's account information. I think "draw backwards" is available in all of the version 2 updates. Sorry for all the back and forth-- I definitely have version 2.0.3 I will look for the draw backwards again. The example you sent me of what the page looks like, is similar to my page but without the drawbacks. Let me write Korean font in video scribe. I do not think Korean language is natively supported by Videoscribe yet.